In other news around the conlanging world, an article was published in The New Yorker today on my good friend John Quijada, the creator of Ithkuil. I got to hear this story as it unfolded over the course of the past few years, and I think this is a pretty good summation. I definitely recommend it. In the article it’s mentioned that “Dothraki is now heard by more people each week than Yiddish, Navajo, Inuit, Basque, and Welsh combined”, as if this meant anything one way or another. On this, I’ll only say that Inuit is not the name of a language, though if you ever want to look at a wonderfully fascinating language, I recommend Inuvialuktun (I’ve got a grammar of it that I did not steal from the UCSD library [I returned that copy (eventually)]). 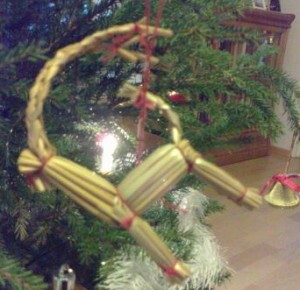 Posted on December 17, 2012, in Community and tagged misc, other conlangs. Bookmark the permalink. 12 Comments. Nevertheless, I think the very first picture (the almost white goat) is the best candidate for ‘winter goat’. Most of our petting zoo animals don’t have names, but I’ll ask if that one does have a name. Back in 2004, we had a really incredible snowstorm hit us on New Years’ eve. By the time I got up, the snow was already so deep I couldn’t get my truck out of my yard. So, being stranded at home, I walked over to the zoo, and helped with chores (they were shorthanded, too). When we were working in the Blackbuck antelope pen (A species we no longer hold ), we found a baby blackbuck, born the previous night. No one even suspected that mom was pregnant. We named that fawn ‘Winter’. We eventually traded Winter for some other animal. Wow! I’d love to have seen a baby blackbuck antelope! It’s such a pitty I couldn’t send you some goats from Argentina! Will do next time! My vote will have to go to Dorvi #3 even if it looks kind of like a sheep, hehe. 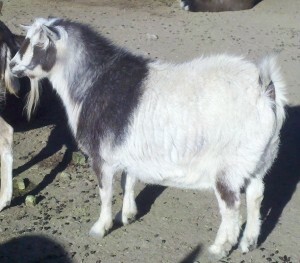 The first one has the best goatee and is thus my favorite goat (of the set). Gotta love a good goatee. So my favorite is Dorvi #3. Stalemate! We need a tiebreaker! You asked for it, so here it is! Our zoo’s assistant manager was pleasantly surprised to find several of our dorvi pictured in your blog (she and her husband are big GoT fans). Dorvi #1 is named ‘Caspian’. Dorvi #2 is named ‘Jasper’. 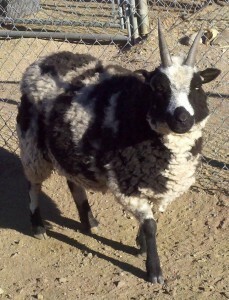 Dorvi #3 is actually a sheep species (Jacob’s sheep) and is named ‘Molly’. Sheep and goats are closely related ungulates and are easily confused with each other. All three of these ‘goats’ are hand-tame and are part of our petting zoo. This reminds me, zhey hrakkar! What’s the name of your zoo, and does it have a website? I’d like to add it to this post so folks can know where the pictures came from. And Molly is a sheep! Oh no! 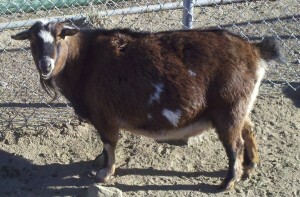 Do you think that disqualifies her from being Winter Goat…? If so, that’s too bad, since that was my pick. Oh well. I love those names! If I’m back in Reno again, I’d love to visit them. I don’t think Molly should be disqualified, if you picked here. Its your call (but she does look like a sheep). So that is the zoo! I thought it was another, because the site says you have ligers again! Is this true?! There weren’t any when I was there. I’m sorry to have missed them! No, I did see Nikolai (gorgeous picture, by the way! ); I just didn’t see the liger.